Bazar – Reinventing the Coatrack Clever. With Bazar, Steffen Kehrle has reinvented the coatrack: “The idea behind Bazar is to make the whole space between the product’s top and bottom usable for storage. Thanks to Bazar’s unique construction, each surface can be used for storage. Coats and jackets can be hung from top to bottom, scarfs and shawls can be put in between and keys and gloves can be stored on the shelves”, says the designer. Versatile. 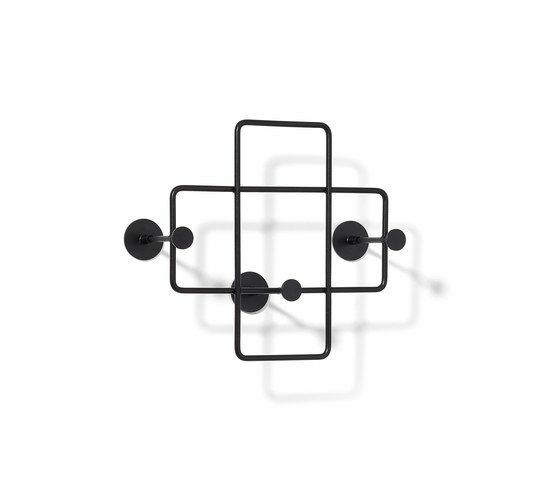 The Bazar coatrack range includes a free-standing design and three different wall-mounted models. Each version is made from powder-coated steel, with body and hooks available in black, grey, white, blood orange and daffodil yellow. The shelves for the free-standing design come in lacquered MDF, black-glazed oak or natural oak. Each shelf features small notches so that the shelves can be inserted from the top at any desired height. Thanks to this solution, the coatrack’s interior offers additional storage space.